At Odom Sparks & Jones, PLLC, we pride ourselves on fostering the opportunities you need to grow your commercial interests. We do this by placing a unique focus on building relationships and solving problems. This approach means we work closely with you. As business law attorneys, we get to know you. As a result, we understand your unique circumstances and needs. We address those needs today and, in doing so, position you for future success. Our firm's attorneys serve an established client base of employers (including those employers facing workers' compensation issues), insurance providers, governments, nonprofits and individuals. 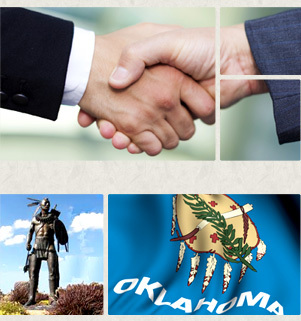 We are proud to include Indian Country business interests as well as oil and gas concerns in this group. We serve our clients' needs in transactional matters and aggressively protect their interests where they are threatened. Our experience enables us to craft solutions that are as economically efficient as they are effective, both in traditional litigation matters and in alternative dispute resolution as well as in administrative law matters. We boast a roster of experienced attorneys, including seasoned political leaders and business community members. Our entire team dedicates itself to the community at large. We take a direct interest in providing clients throughout Oklahoma with the resources and relationships they need to continue our region's consistent economic growth. We invite you to contact us for an initial consultation. We can be reached by phone at (405) 701-1863 and online. All consultations remain confidential.